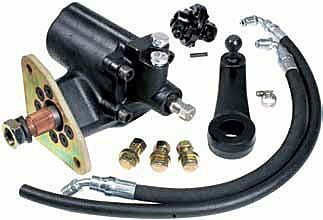 This power steering kit consists of parts to convert your 48-52 Ford F1 pickup truck straight axle pickup to power steering. The kit comes with a NEW power steering box, mounting brackets, u-joint, hardware and a pitman arm to fit your stock drag link. Also includes power steering hoses. Please Note: Because there is no other power steering kit made for the F1 specifically, we put this kit together. This kit is actually for another year Ford truck. It’s not ideal, but it’s the best solution out there. The install isn’t hard, but it isn’t a simple bolt in either. The steering box and mounting bracket will need to be mounted to the frame to line up to the stock steering column as well as you can. You will have to drill a few holes as the mounting plate on the new box is made to fit another frame pattern. Again, not ideal, but it’s the best we have. The rest of the install is straightforward. You must use a U-Joint (not a rag joint), which is supplied, to connect the column to the steering box. 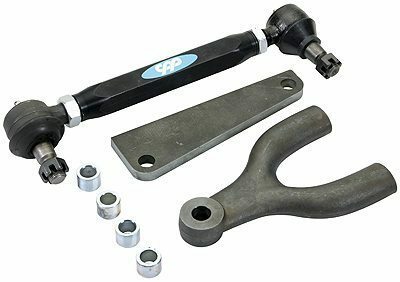 This power steering kit consists of parts to convert your 48-52 Ford F1 pickup truck straight axle pickup to power steering. The kit comes with a NEW power steering box, mounting brackets, u-joint, hardware and a pitman arm to fit your stock drag link. Also includes power steering hoses. This version does NOT include a steering column saver kit to convert your stock column for use with the new PS box. 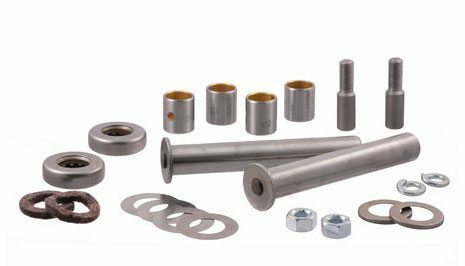 Please use part # CPP-F100CS The column saver kit consists of a bushing/bearing and locking collar to give support to the shaft in the steering column. This 48-52 Ford F1 power steering kit is a great way to add power steering to a straight axle 53-56 Ford pickup. Note: Will not work with 3 speed on the column shift linkage. The steering column has to be shortened above the steering box and won’t allow enough room to keep the lower shifter rods attached. The kit works fine on floor shifted automatic transmission and manual floor shift applications. 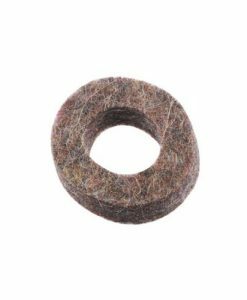 Works with almost all power steering pumps. PS pump is not included. 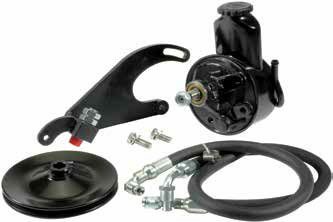 Power steering rubber hoses and several fittings to fit common pumps are included.